One of the things that Unspun has learned from this bypass saga is that while the bypass operation itself is important, it is actually the post-surgery care that is just as important. Get bad aftercare and you’re stuffed in more ways than one. One of my friends tell me this horrendous story of a patient who had his lungs collapse, a steel pin holding the sternum together come loose and all sorts of unnecessary suffering her uncle went through because of bad aftercare. I first heard of my heart surgeon would-be from my cardiologist, who’s no light weight in repetitional terms the Malaysian medical profession himself. In his opinion if I had to have heart surgery, and I did, then I should seek the best heart surgeon in Malaysia and that is Datuk Dr Rozali Wathooth from the Sime Darby Medical Center (they changed the name in a fit of rebranding but everyone else still calls it the Subang Jaya Medical Center). As a cardiologist, he said, he’s seen Dr Rozali’s grafts and they are all very good and lasting. he even ventured that one of Dr Rozali’s grafts should last me at least another 20 years, provided, of course, that I take care of myself in terms of diet and exercise. The cardiologist also said that Dr Rozali was very fussy about which cases he took on, but he was quite confident that he would take on my case. That was abut two months ago and my trip to Malaysia was a short one. What happened thereafter was a rushed attempt to meet up with Dr Rozali for my first examination with him. We managed to secure a Saturday morning meeting but was sent to the wrong hospital by the cardiologist’s secretary. That laid the ground for my first meeting with Dr Rozali. Once we (the missus was with me) we frantically called Dr Rozali’s office and tried to reschedule. The secretary said that Datuk would wait for us. When we finally got there we met up with Dr Rozali, a 60+ slightly built man who’s calmness and geniality seemed like oases in our agitated state of having to rush about. He then examined me. What struck me about the examination was his thoroughness and insistence on doing things, even the simple things like taking your blood pressure, himself instead of delegating it to a nurse. He was also thorough in getting my medical history and debriefing me on what to expect. That set the ground for my bypass operation, originally schedule for June 13 but was, as explained in an earlier posting, delayed to June 17 because of a fever. I checked in to the hospital a day before and was examined by Dr Rozali who also spent about an hour counselling me and my wife of what to expect during the operation and after. This was followed by briefings from the anesthetist and the ward nurse, then we were sent up to the ICU for another briefing. I found that these briefings helped a lot because they made you prepared for what was to come. The operation itself was dramatic (see Bypass IV) but it was nothing to me because I was out cold from the general anesthetic. When I came to my wife, sister and her boyfriend was there together with Dr Rozali. Over the next few weeks Dr Rozali was to exhibit such a level of care, understanding, compassion and humility that I was swept away. It seemed that he was always there at the hospital, making personal visits to me and other patients at least twice a day. In all our conversations he just seemed so understanding, caring and unperturbed that you felt better after taking to him, no matter the level of pain you felt. He was also very strict about not taking chances with his patients. For some reason, probably a residual effect of the aspirin I was taking (but stopped a week prior to he operation) I had a tendency to bleed. Dr Rozali was very careful to keep the two tubes leading from my sternum to drain the “bad blood” from the operation scars for four days until the flow ebbed to an acceptable volume. It was only then that I was discharged from the ICU. This made him accessible to his patients at all times, something that Unspun tested when the aspirin he was taking caused him to have some hemorrhoids. All I had to do was to call the cardiac ward and leave a message with the nurses and Dr Rozali would call back soon after to listen and advice. These and many other instances leads Unspun to agree with my cardiologist that Dr Rozali’s probably the best heart surgeon in Malaysia (Incidentally, a classmate of mine who also had to have a bypass operation more than a year ago did his homework more thoroughly than Unspun in seeking a heart surgeon. Aided by his sister who’s a doctor he made many inquiries and all answers seem to point to Dr Rozali as the best surgeon if you have to have a heart surgery. He went to Dr Rozali and now swears by him). Dr Rozali has been at the forefront of cardiac surgery in Malaysia for a long time. A friend of mine in The Star in the 1980s remembers covering a story of how Dr Rozali performed the first open heart surgery in Malaysia then. Since then he’s gone on to perform hundreds of heart surgeries, reputedly with a 100% record of success. He also sits on the board of doctors for the Institut Jantung Negara, Malaysia’s premier heart center. That means he gets called in when VVIPs, such as former Prime Minister Mahathir Mohamad, needs to have a bypass. The information you can get about Dr Rozali’s achievements are abundant but what makes him so special as a a man and a doctor is the level of care, compassion, experience, expertise – and humility that he brings to his job. This sets him apart and makes Unspun, like his classmate, swear by Dr Rozali if you have to have a bypass. You’d never have a better heart surgeon anywhere else, IMHO. Indonesian doctors can learn a lot about bedside manner and being a good doctor to their patients from Dr. Rozali. When my dad had a surgery, the surgeon just came and went without any explanation. And if I hadn’t stopped him and asked a lot of questions, he wouldn’t even bother telling us anything. Glad to know you’ve got the best surgeon in town and this is great. This is definitely a huge plus and it does wonder to the mind with a positive mental frame of mind for your full recovery. so now the great question.who is the best heart surgeon in indonesia then? because surely I can’t go to malaysia. Pingback: how to cure panic attacks? Was in the hospital in Canada a number of years ago and there was many Indonesian cardiologists working there. Glad to hear you survived to tell the tale! he is remind me to the best surgeon in drama… i’m glad to hear that there is surgeon like him..
Waaah Aduh! Aren’t doctors amazing when they are good! My son Jeremy has had 3 lots of heart surgery, the first at seven weeks old (then 21 months and 12 years). His cardiologist was an Englishman Brodie Knight, now somewhere in Scotland I think, then in Adelaide, Australia. His heart surgeon at Melbourne Children’s Hospital was Kiwi Roger Mee, since head-hunted to Boston US, lured I think by building a teaching hospital for/ around him. Amazing men in the new field of infant cardiatrics, probably still only 30 or so years old. Jeremy now 23 was only the 21st child in Australia to survive birth without a pulmonary artery and land in the right decade to have a chance of survival. The most terrifying op for us was the first one – his whole body was smaller than three adult hands laid side by side, his heart the size of his fist – for him the 3rd, because he was old enough to know it was happening and TOTALLY POWERLESS. So scary to go into an op after a briefing that includes – as it should – the fact that there’s a small possibility that he won’t survive. “Mum, can’t we just go home without doing this.” “No honey, without this operation you will definitely die”. Aduh aduh Kasian. I am delighted to hear that my friend UNSPUN has been re-spun in such a successful fashion. Bless the world’s good doctors, they’ve kept many a good man and woman alive to do great things with the extra days of their lives. At his age, 60+, Dr. Rozali has amazing hair. His hair is very thick, amazing. Next time you’re in contact with him unspun, ask for the secret behind it. Back in 85 or 86..Datuk Dr Rozali Wathooth was the guy who did the open heart surgery for me. I can’t really remember him personally because I was a baby back then but I would love to meet him again to say thank you. How I am able to see him? can you tell me how is the best heart surgeon in indonesia and can you tell his id? Truly agree… he is the best surgeon. Yes..Datuk Dr Rozali Wathooth,you are the best !!! Had my CABG done by Dr Rozali Wathooth on 19March2013. A wonderful surgeon and who is fully dedicated to his profession. Warm, caring and humble – such traits are difficult to find. An experienced surgery team, has been with him for more than 20 years. First class heart surgeon and has my full recommendation!!. @Pang Sing: he’s a wonderful doctor and human being, isn’t he? 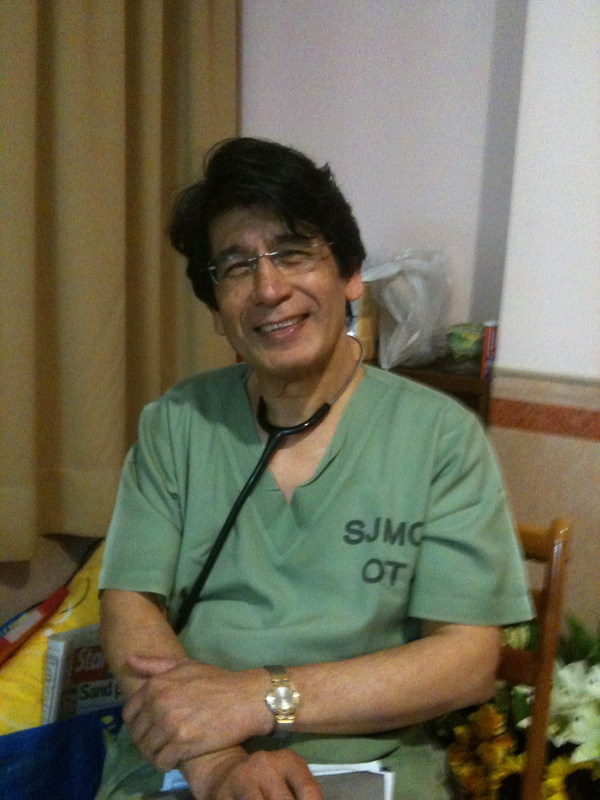 Fast forward to 7th October 2013, my mother-in-law just had her surgery performed by this wonderful man. Arguably the best cardiothoracic surgery team in Malaysia today. Completely unassuming, humble, god given talent and skill and unlimited compassion. As you inspire the patients and families may you inspire the next generation of cardiothoracic surgeons in Malaysia and across the globe. I really appreciate the amount of efforts Unspun has taken to highlight the virtues of Dr. Rozali. Guess credit must be given where due. My story on further enhanced how Unspun felt about Dr. Rozali. Like Unspun, I was fit , and was jogging 5 km , 4 times a week . However after my angiogram , my cardiologist confirmed I needed a bypass as there was some severe blockages in my main left artery. Being kiasu to ensure that I will be operate by a competent surgeon, , I never fail to take the opportunity to check out with a few cardiologists as to whom they would choose if they had to do a bypass operation. Not surprising, the answer is always Dr. Rozali from SJMC . Even my non heart specialists friends said that I am in good hands when I mentioned that I have chosen Dr Rozali for my bypass.surgery. I did bypass on 5th June, 2014 . Prior to this , I have heard many scary stories about the need to cut you up and open the rib cage during a 6 hour operation but I am so comforted when my cousin who had an earlier a bypass told me that there is “no pain ” at all. It was a great surprise and gave me confidence to promptly go ahead esp . when he said ‘you will not regret ” having your operation carried out by Dr Rozali . True to the word , I did not suffer any pain at all until the day I was discharged . The expected l coughing after the surgery was a discomfort but nothing unbearable. When I was told Dr Rozali is the best around, I did not fully fathom the depth of their comments . I was thinking more about his skills and wealth of experience but little did I know that unsurpassed level of care and attention he would devote towards looking after me during the post surgery recovery stage . Given his stature of being a very renowned cardiothoracic surgeon in the country,, he is amazingly humble, unassuming and and gentle. There is no question too trivial for him to answer. His dedication is so assuring . No matter how tired he is, he has been known to be beside the patient till wee hours in the morning.I always look forward towards his visitation as it is never the usual quick superficial type but one which is genuinely focus towards your well being. He asks questions and carefully check with the nurses to ensure everything has been looked into. He listen attentively if you have anything to say and never once has he ever being dismissive. His gentle patience and his unfailing winsome smile never fails to cheer up you up. His concern and dedication to your well being is beyond words. This is not only confirmed by the other patients in the ward but the nurses who says that they can phone l him anytime if anything is a amiss as Dr. Roazli is not the person who will show any signs of annoyance of being disturbed but genuinely to know how is the patient faring. When I had some blood in my stools due to my inherent hemorrhoids and also some rashes due to drug allergies, I can clearly see his single mindedness and devotion. Never to take any chances , he took the trouble to call upon other consultants to ensure all is well. .After hearing all the positive comments from my other friends and doctors, I can now also personally vouch and agree wholeheartedly with what my cousin brother had earlier said that “ I will not regret having him as my heart surgeon” as no one can deny his dedication and work ethics . I pray that there will be more aspiring heart surgeons who not only have his excellent surgical skills but can emulate his level of gentle patience , dedication and passion , a very rare commodity in this money driven world. I count it a priviledge to be under his care and to me, there could only be one and only heart surgeon like Datuk Dr. Rozali Wathooth . Just came across this site. Yes, My hats to Datuk Dr Rozali Wathooth. He did my bypass in 2003. Great surgeon. He told me I have a 50 % chance . The other 50 % is God.While I have been seeing him & Dr Lawrence Chan for the past 11 years & he still keeping my heart pumping. He is the one & only surgeon who grafts the vein from your hand. Other surgeon mostly from the leg. Thank you Datuk Dr Rozali. Indeed he is not only an excellent dr but also a wonderful person. His care is so personalised that you would feel that he is family you can trust. I had my surgery done in 2010 under him and must say have a new leash to life all because I was in good hands. Thank you Datuk Dr Rozali. May GOD bless u always.